Only a few days after return from Helsinki I was scheduled by H.B. Sportflugzeug-Service GmbH for the annual inspection of my aircraft which is registered in Germany. The weather forecast for Thusrday morning, May 7th 2009 was good for the western part of Austrian Alps and therefore I decided to fly a different route this year. Via Homebriefing I have filed the following route: LJDI - TRIESTE- GRADO- PORTOGRUARO - ROKIB - OZE - NATAG -LOIH. I was planning to cross Italian Dolomiti first. I took off at 5:36 local time before the sun rise. After crossing Italian border I climbed to 5000 feet and soon after crossing GRADO point I was cleared direct to OZE (Bolzano VOR) and to start climbing to FL120. The sun was rising and the view was marvelous. I crossed Austrian border at NATAG point and soon after that I started my descend to Hohenems-Dornbirn airfield (LOIH). I was slowed down my descend as the airport opened at 8:00 local time. I landed at 8:03 local time at this wonderful airport with a very cheap MOGAS (only 1,14 EUR/liter). After refueling I took off immediately and headed towards Essen-Mülheim (EDLE) . The route was: LOIH-SENDER(VRP)-NUNRI-FHA-USETI-SUL-GAGSI-KRH-DONAB-COL-WYP-EDLE. The flight was uneventful and I landed at EDLE at 11:13 local time. Mr. Jörn Claassen, who is the manager, inspector and also mechanic with some young mechanics immediately started to work on my Piper. They had to perform 50 hour check + annual check and also replace oil hoses. My flight back to Slovenia was scheduled to be next day around 10:00 local time due to predicted bad weather. Everything was running very smoothly and according to the plan and again I have experienced their professionalism. The results of exhaust valve inspection were extremely good and therefore I got a good forecast for extending engine hours beyond 2000 hours. After end of the working day Andreas Kremer took me with him to my hotel which was only a block away from his home. This time I was sleeping in Haus Kastanienhof in Mülheim. I found this hotel very nice with extremely helpful staff and free wireless Internet connection. Mülheim is pretty unknown town although it has 160.000 inhabitants. I had enough time to make a short walk to the downtown and, of course, make a stop for a good dinner with excellent German beer. Early in the morning a thunderstorm woke me up, but in a short time the weather became much better although with a lot of clouds and relatively low clouds. An inspection flight was performed in the morning and everything was found o.k. After some final paper work I was able to depart towards Letkov (LKPL) near Plzen in Czech Republic where I planned to make a refueling stop. The weather was still quite unstable and changing very quickly so I was expecting hard conditions. Because of such conditions I was planning to make a refueling stop in case that I would have to fly long diversions due to bad weather. Without head wind I can make a direct flight from EDLE to Divača (LJDI). The actual radar images showed still a lot of raining areas on my route but fortunately they were dissolving and therefore I was expecting a better weather more to the east. After departure I had to fly at 1500 feet maximum due to controlled airspace above. Later on I was able to climb to 2500 feet but due to low clouds I had to descend back to 1500 feet. Later on I was able to climb higher and fly between two cloud layers. The weather was improving and the second half of my route was already flown in clear sky. I passed Czech border at VEMUT point and then descended to Letkov(LKPL). This was the second time I visited this airfield. I landed on runway 26 after 2 hours and 17 minutes. I taxied directly to the gas station where we refueled with MOGAS. I checked the weather situation and the satellite image of Alps showed practically cloudless situation. 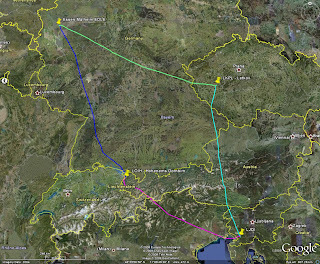 I decided to fly directly across Alps and immediately filed a flight plan by calling Prague briefing. I departed from Letkov at 14:57 local time and immediately requested to climb to 9000 feet inbound ETIMA point at German border. The filed route was: LKPL-ETIMA-SUBEN-ARNOS-KANIN-LJDI. When I have crossed Austrian border I was cleared to climb to FL125. There were some clouds over Alps but none directly in front of me so I was able to fly along the planned route. The flight was uneventful and only close to Slovenian border when I already started to descend I had to avoid some clouds. I safely landed at my home airport Divača (LJDI) after 2 hours and 31 minutes.